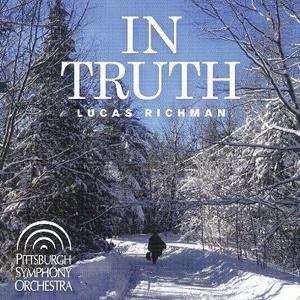 Following the Knoxville Symphony Orchestra's rousingly successful premiere of Lucas Richman's piano concerto in 2013, the Pittsburgh Symphony Orchestra, where Richman was resident conductor and a frequent guest conductor, was approached about a recording of the piano concerto; a concerto for oboe and orchestra, commissioned and premiered by the Pittsburgh Symphony Orchestra; and his Three Pieces for Cello and Orchestra. With world-class soloists, the famed Pittsburgh Symphony Orchestra, and Lucas Richman conducting, the recordings are brilliant and authoritative. Lucas Richman is music director of the Bangor Symphony Orchestra and was music director of the Knoxville Symphony Orchestra for 12 years. His music has been performed by more than 200 orchestras across the United States. Pianist Jeffrey Biegel, principal oboe of the Pittsburgh Symphony Orchestra, Cynthia Koledo DeAlmeida and Israeli-American cellist Inbal Segev are the soloists.